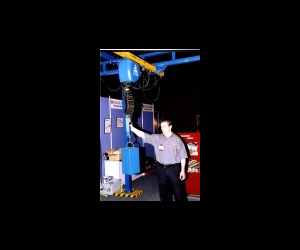 Major Australian auto manufacturer solves lifting problems with G-Force. Lifting more than 1,200 doors per day onto trolleys that supply the assembly line. The product chosen was 2 x Safetech Gorbel IAD Bx70 G-Forces (Intelligent Assist Device) in conjuction with a simple end effector and hung from a single ceiling mounted Gorbel enclosed track, light weight crane system utilising 2 x bridges. With a 100% duty cycle rating and a lifting capacity anywhere from 1 to 70 kg without the disadvantages that air or spring balancers normally encounter, the high speed Safetech G-Force was seen as the perfect product to lift the doors from the lift onto the trolleys. Each G-Force handles in excess of 600 doors a day giving the manufacturer increased productivity and eliminating the risk of injury as each operator only expends about 12 grams of energy to move each door. As space is very limited, the only other real alternative would be to manually lift the doors from the lift onto the trolleys. This was an unacceptable OH&S issue.